This entry was posted in news and tagged MINI Hardtop MINI USA on January 30, 2014 by James Day. 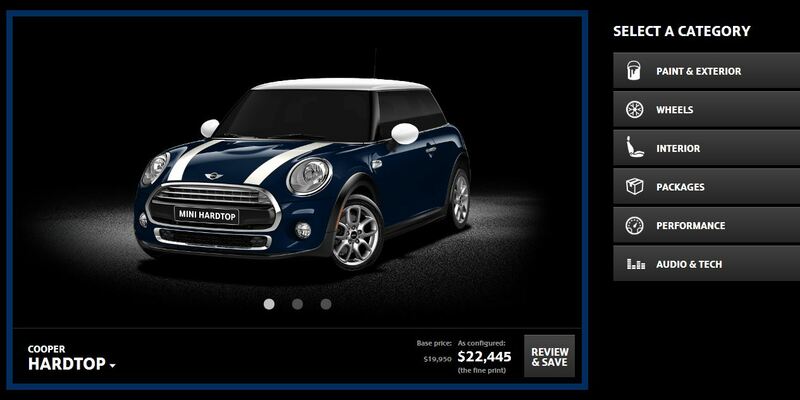 MINI USA updated its Configurator to include the new MINI Cooper Hardtop and MINI Cooper S Hardtop (excluding the MINI John Cooper Works Hardtop which arrives next year). Dynamic Damper Control costs $500, LED Headlights are $750 (or $1,250 with Cornering Lights). The new MINI Head-up Display is $500 if bought separately. The Park Assist Package is a $1,000 charge. And a Smoker’s Package (cigarette lighter in dash) is $50 if you want a 12V outlet for your gadgets. Build your MINI at http://www.miniusa.com.